Provided by: Luke Chung, President of FMS, Inc.
We all want speed and faster performance in Microsoft Access. As tables get larger, secondary indexes can help speedup queries, searches, and links between tables. 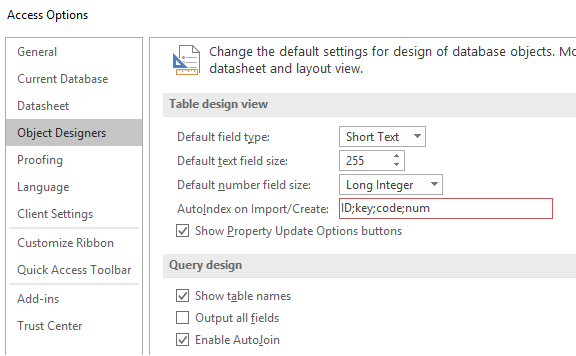 By default, Microsoft Access has a setting that automatically adds secondary indexes on fields based on their name. Unfortunately, this can create additional problems. Adding too many indexes to a table and duplicating indexes on the same field can hurt performance and increase your database size. Not every field name that begins or ends with the default values should have a secondary index. Some fields that aren't named that way may need secondary indexes, so using the default setting is not a wise solution since thought should be put into this. Some secondary indexes may involve more than one field, so single field indexes may not be helpful. When you import a table with these settings, the indexes are added to your new table automatically. That may be fine for a brand new table, but if you are importing a table to replace an existing table (from a backup) or creating a new database by importing all the tables from an existing database, a whole set of new secondary indexes may be added unnecessarily -- essentially undoing the work you may have done to determine which fields shouldn't have indexes. If you have our Total Access Analyzer program, this setting is one of the ~300 issues detected when your database is documented. Learn more about how Total Access Analyzer can help you create better Microsoft Access applications.